Plan for the day: Focus on problematic chapter in Part One,[it was one of a number of previous first chapters, but which now sits four (perhaps five) chapters on]. Needs transition to its new location and removal and improvement of content that has now found an earlier home. If time permits, work on other areas. Edit progress: Found a way to leap forward four years (hopefully seamlessly) and noted redundant stuff as well as foreshadowing an imminent and unwelcome event. Did not enter new text but flagged all new ideas to work on. Feeling satisfied with the day’s efforts with that chapter. Also had a look at the final chapter for Part Two which will now become the end of Book One (Always . . . ? – I think that title may remain). Again no new text, but the same flagging of new approaches. Needs to be fleshed out, to leave just a little doubt about whether it is a ‘happy ever after’ conclusion. 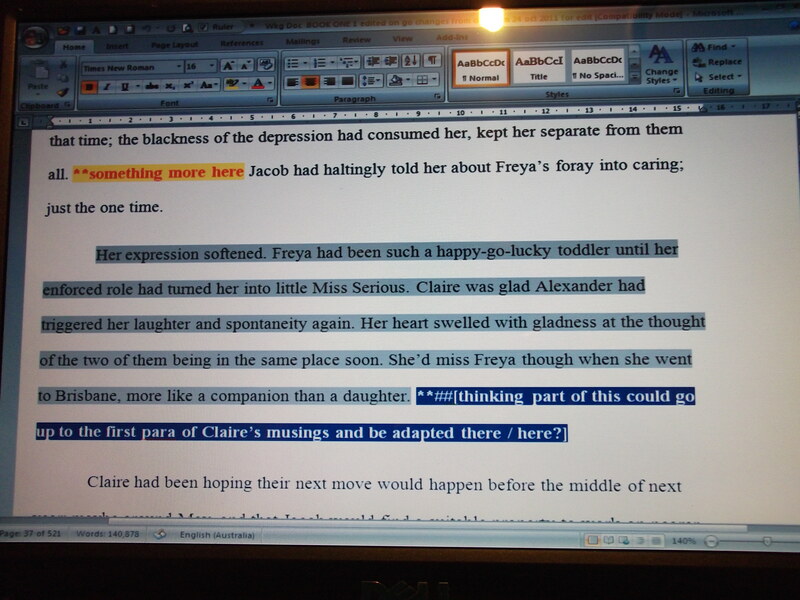 Other: Almost completed the critique of a chapter of a finished novel from one of the Writer’s Group members. It’s getting near to submission stage. Another friend sent details of a short story competition. I’m thinking about that, feeling a bit non-committal about entering.